In many of the Resurrection accounts in the New Testament, those to whom Jesus appears are often found afraid (Mt 28:5), amazed (Mk16:5), seized with trembling and bewilderment (Mk 16:8), terrified (Lk:24:5), downcast (Lk 24:17), near despair (Lk 24:21), weeping (Jn 20:15), and lacking in faith (20:25). After their encounter with the Risen Lord, they are all transformed from within because the ultimate hope of their souls is confirmed. Unconditional love exists and has blasted through space and time and is available to us for all eternity. How can one not be overwhelmed with joy at such good news? It’s a unique experience to live with Jesus. 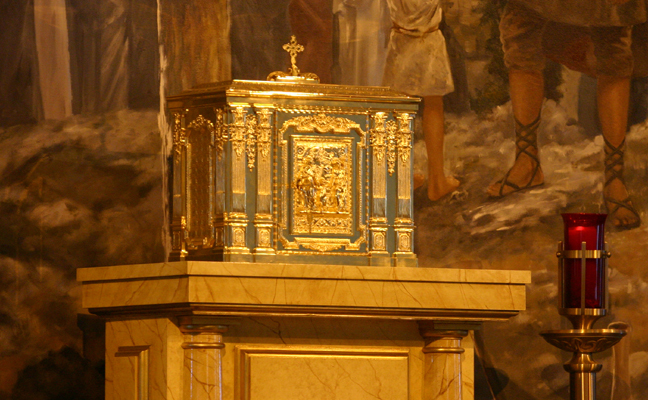 As friars, our friaries (yes, that’s really what they’re called) all carry a chapel, and our chapels, of course, all house a tabernacle: this is where Jesus is present in the Eucharist always. In a real and mysterious way—a really mysterious way at that—we live under the same roof as the Lord. After having that experience for days and weeks and months and years, I’ve found that if I’m away for some time, I do miss Him very much. In fact, I’ve come to say that “home is where the tabernacle is” because Jesus is home. Yet, there comes a dreadful time every year when Jesus leaves. We are left alone in a friary with an empty chapel—with no Jesus. After Mass on Holy Thursday, through Good Friday, and all the way until the evening of Holy Saturday, the chapel is stark, empty, and easily avoided. Of course, it’s not without reason that we do this, and not just us but all Catholic Churches around the world; we enter into that severe, barren time in the history of the world when Jesus died. And this is the fruit: love—clinging-to-his-flesh and kissing-his-wounds kind of love of the resurrection! One year I was so overcome by joy and gratitude that I could hardly sit still in the chapel, and I kept penning little reflections conveying this moment, a moment that history felt once and continues to feel, like the happy waking from a recurring nightmare whenever one enters into the reality that death is more a beginning than an end. To see you again, Jesus! I was without compass in your absence—no bearings, no hopes—restless and lonely. But you’re here now, and heaven is in reach; like an orphaned child, I am reaching. 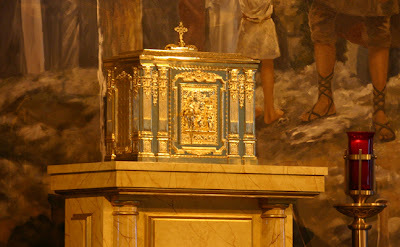 Lord, having you back in the tabernacle gives me reason to smile again. My heart quickens and I can laugh again. O mighty Resurrection, descend into my little heart that I may be transformed; a new creation, a new man alive with new life in a new way—living and new! Everything is different today, and I will never be the same again.